« Iran deal an ‘exemplar’ or leading to ‘collapse’? Iran continues to state it will destroy Israel. In an address to the U.N. General Assembly, Pope Francis exhorted presidents and prime ministers to show leadership in combating climate change and poverty and in protecting refugees fleeing conflicts. The 78-year-old pontiff, speaking Friday morning at the United Nations headquarters in New York, tied “misuse and destruction of the environment” with what he called the “relentless process” of economic and social exclusion of disadvantaged members of society. Those who are “excluded,” he added, are left outside the realm of economic development and advancement, “either because they are differently abled [handicapped], or because they lack adequate information and technical expertise, or are incapable of decisive political action. “Economic and social exclusion is a complete denial of human fraternity and a grave offense against human rights and the environment,” Francis said. I will add that a temporary peace will come to the Middle East consistent with Daniel 9:27–but this will end in the destruction of the USA and its Anglo-Saxon allies (Daniel 11:39), various ones in the Middle East and North Africa (Daniel 11:40-43), and ultimately Europe (cf. Daniel 11:44-45). 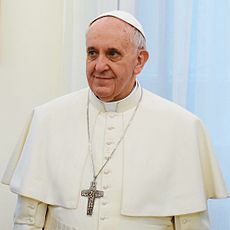 What Pope Francis is advocating is not the way to real peace, but a type of system that the Bible warns of throughout the books of Daniel and Revelation (e.g. chapters 13,17,18). While the world seems to be impressed by the pontiff’s cooperation and words, what Pope Francis and Ban Ki-Moon are seemingly trying to do is repeatedly warned against in the Bible (Revelation 13:1-18, 14:12, 18:4; Zechariah 2:6-7). While he looks like a lamb to many (cf. Revelation 13:11), it needs to be pointed out that Pope Francis does have a different plan for it than God does. Pope Francis is promoting world unity through human efforts as opposed to proclaiming that only the Kingdom of God will be able to deliver. This entry was posted on Friday, September 25th, 2015 at 2:00 pm	and is filed under Religious News.